We all dream of the day when we don't worry about our smartphone running out of battery – and that day could be soon as a gentle stroll round the park may be the answer. Scientists at the University of Wisconsin-Madison created the technology – which is now ready for the commercial market under the title InStep NanoPower – that uses the kinect energy of you walking to generate electricity. The technology can create up to 10 watts of power per a square meter walked, and the inventor believes it one day could hit 10kW. The shoes harness "bubbler" technology, and we'll let the University explain exactly what that is. "The researchers' bubbler device — which contains no moving mechanical parts — consists of two flat plates separated by a small gap filled with a conductive liquid. The bottom plate is covered with tiny holes through which pressurized gas forms bubbles. The bubbles grow until they're large enough to touch the top plate, which causes the bubble to collapse. "The speedy, repetitive growth and collapse of bubbles pushes the conductive fluid back and forth, generating electrical charge." 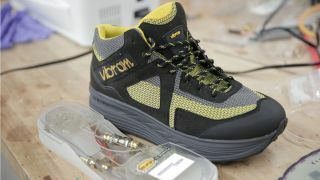 With the technology already able to generate 10 watts of power, it can easily charge a smartphone which requires around 2 watts - although there's currently no connection to link up your handset to the shoes. InStep NanoPower is going to need to commercialise the technology before we're able to see it installed into our very own shoes and ready to connect up to your phone. The company is looking to put the technology out now, so hopefully there will be some interest. At the moment the technology can charge up a flashlight and power it at walking pace, and you can see the video just below.